PT Elnusa Petrofin - EPN or latter known as Elnusa Petrofin is a fast growing oil and gas company in Indonesia with core competencies in downstream oil and gas services. PT Elnusa Pertrofin performing business in fuel storage, fuel distribution, fuel and chemical trading, gas station and LPG filling station. PT Elnusa Petrofin is an energy distribution and logistic services subsidiary company of PT Elnusa Tbk, a leading publicly listed oil and gas drilling service company in Indonesia. As of December 2015, PT Elnusa Tbk holds a 99.99% shares in Elnusa Petrofin. Elnusa Petrofin was first established in 1993 as a fuel and chemical division of PT Elnusa Tbk. In 1996, PT Elnusa Petrofin officially established as an independent company. The Company is based in Jakarta and its head office is registered at Graha Elnusa Building 12 Fl - Jl TB Simatupang Kav 1B Jakarta 12560. In year 2015, Elnusa Petrofin recorded total assets of Rp 451.01 billion. This total assets reflected an 6.07% increase from Rp 425.17 billion in 2014. Total revenue in 2015 amounted to Rp 1.3 trillion or 18.75% down from Rp 1.6 trillion in 2014, according to PT Elnusa Tbk Annual Report 2015 as cited by JobsCDC.com. Male, with the maximum age of 24 years old. Minimum background in Bachelor Degree (S1), majoring in Informatics Engineering, Petroleum Engineering, Chemical Engineering, Chemistry, Environmental Engineering, Mechanical Engineering, Public Health, Oil and Gas Logistics, Transportation Management. Minimum GPA of 3.00 for State College (PTN) and 3.50 for Private College (PTS). Have a good leadership skill. Have a high integrity and credibility. Sociable and able to work in team. Willing to be placed in all working area of Elnusa Petrofin. JobsCDC.com now available on android device. Download now on Google Play here. Please be aware of recruitment fraud. The entire stage of this selection process is free of charge. 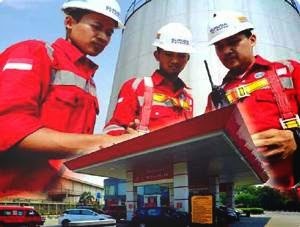 PT Elnusa Petrofin - Recruitment Graduate Trainee Program ELNUSA Group April 2017 will never ask for fees or upfront payments for any purposes during the recruitment process such as transportation and accommodation.